The date was April 15th 1987 on a damp night in Baltimore, when”Team Streak” turned it up a notch. 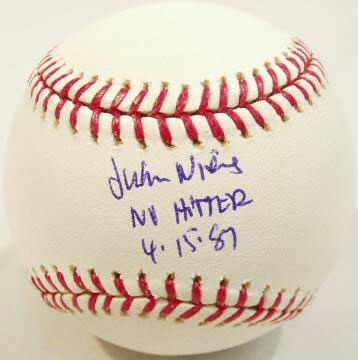 21 year old Puerto Rican left hander Juan Nieves, threw the Brewer’s first… and to date only, “No Hitter”. Nieves who was in his second year in the big leagues took the mound against the hard hitting Orioles, and held them hitless for nine innings. A few outstanding plays by Molitor, Paciorek, and Yount helped (every No Hitter gets some help). The Crew won the game which was the team’s 9th win in a row on their way to 13 straight to open the ’87 season, and Nieves became the first Puerto Rican born pitcher to throw a “No-No” in the majors. As mentioned in the previous article (“Brewers Wall of Honor”) a pitcher would need either 2,000 innings, or 250 appearances to make the “Wall,” Nieves has neither. During his 3 seasons in Milwaukee (and the big leagues) he only appeared in 94 games, and accumulated 490&2/3 innings. 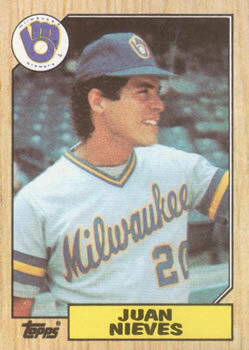 The Brewers signed Nieves in 1983 out of Avon Old Farms Prep School in Connecticut, making his MLB debut on 4/10/86 at 21 years old, his final game was 10/2/88. During his 3 seasons he had 32 wins against 25 losses, a 4.71 career ERA, with 352 strike-outs. 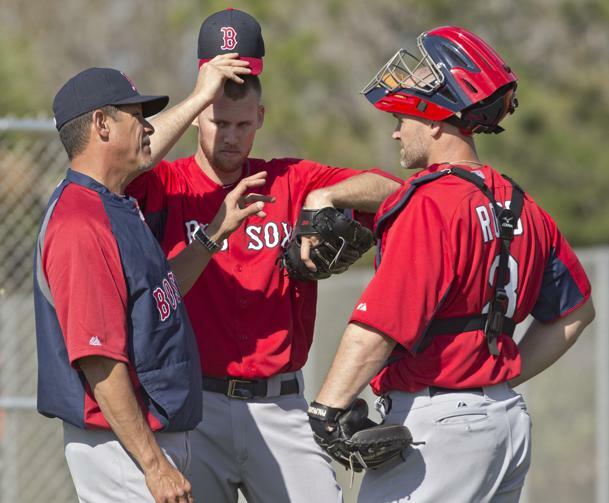 After his pitching career ended Nieves became a pitching coach in 1992, and worked his way up through the coaching ranks until finally getting his “hardware” as the pitching coach this past season (2013) for the Red Sox who won the World Series. I get it, the Brewers had to set benchmarks otherwise the “Wall” would have every player on it and, it would be ridiculous. They also had to set them high enough to make it relevant. Nostalgically, the initial 58 are names of players who put in their time, and are synonymous with the Brewers. When Geoff Jenkins is mentioned, one thinks of #5 for the Brewers, not #10 for the Phillies, or Jeff Cirillo as #26 defending the hot corner at County Stadium, not one of the other numbers he wore with 4 other teams. The statistics for most of these players unless their number is retired, are pedestrian. Take for example Craig Counsell, Chuck Crim, and Chris Bosio. Counsell appeared in 2,063 games with the Brewers and batted .241, Crim pitched in 332 games for the Crew and had a 3.47 ERA, and Bosio racked up 1,190 innings in Brewer Blue… he had a 3.76 ERA. Nieves’s numbers are also very pedestrian, and on their own wouldn’t get a second look…BUT HE THREW A NO-HITTER…that alone should punch his ticket for the Wall of Honor. Juan Nieves definitely has his place in Brewer History, if you agree…LET’S GET HIM UP ON THE WALL… contact the Brewers, and let them know. This entry was posted in Baseball, Milwaukee Brewers, MLB, sports and tagged Juan Nieves, Milwaukee Brewers, no hitter, Wall of Honor. Bookmark the permalink. Agree! Nieves should have a spot on the wall being the only Brewer to throw a no hitter. Why not start petition and send it the Brewers.